Miami, FL- A member of a Miami church was killed Saturday night on the Florida Turnpike just outside Orlando when the van she was traveling in lost control and ejected her. North Miami resident Merlenda Chery, 47, was one of at least 19 people headed to Orlando for a mission trip, when the van driver lost control on the Florida Turnpike. Authorities believe the tread one of the tires separated causing the rubber to peel away from the rim, which sent the van careening down the busy highway were speeds can range from 50 mph to 75 mph. 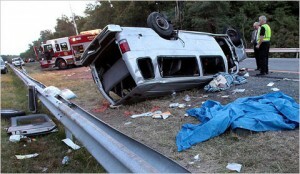 The van rolled-over several times, though police are unclear at this time how many times, the Orlando Sentinel reported. Chery was ejected from the vehicle and pronounced dead at the scene, according the Miami Herald. The driver, Willem Camille, was flown to a local hospital in serious condition. An additional 19 passengers, mostly teenagers, were also injured; three were airlifted and suffering from critical injuries, while the remaining 16 were taken by ambulance, but fortunately none of the injuries were life-threatening. The Florida Highway Patrol stated that the maximum capacity for the van was 15, but there were at least 20 passengers on board and the rear was loaded down with numerous pieces of luggage. The report also noted that most of the passengers, including the deceased woman, were not wearing their safety belts. The bus is owned by a Miami non-profit called GSC Community which also organized the mission; the organization focuses on youth development. As this accident demonstrates, overloading a vehicle can be dangerous; the excessive weight of the van could have put undue stress on tires, especially if there were already existing problems. Organizations and drivers must do everything in their power to assure the safety or their passengers and other motorists. If they fail in this duty, they can and should be held accountable for the harm they caused. Accidents victims can incur a range of injuries from mild to severe, and in the worst cases people die. Those who are fortunate enough to survive a dangerous accident soon find themselves drowning in medical bills and other accident- related costs which they should not have to cover out of their own pockets. Losing a loved one is the most profound pain a person must endure, especially if it could have been prevented. Money can never take away their pain, but it can alleviate their financial worries so they can focus on grieving. When an accident is caused by the active or passive negligence of another, the victims and their families have the reasonable expectation that they will be fairly compensated. Injury victims should never make a decision about their accident settlement without first speaking to an attorney. If you have been injured in any type of accident in the Miami area you should contact the office of attorney Jonah Wolfson to evaluate your case and determine how large a settlement you are entitled to.